German Chancellor Angela Merkel has said she will not seek re-election as leader of the centre-right Christian Democrats party. She has also ruled out running for a fifth term as chancellor in 2021. Several CDU politicians have announced they want to succeed Ms Merkel as party leader. 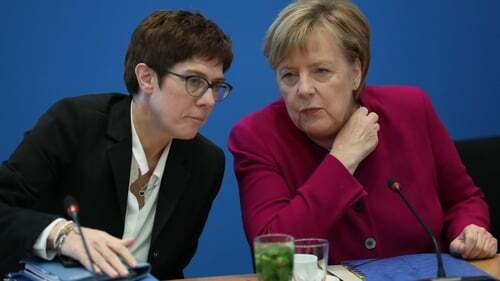 Annegret Kramp-Karrenbauer, 56, probably has the best chance of becoming the next CDU leader after Ms Merkel herself decided in February to name her as party secretary general - a move seen as a succession plan. Dubbed a "mini-Merkel" by German media due to her rational approach to politics, she was premier of the tiny state of Saarland on the French border from 2011 to 2018. Her Catholic, western German background contrasts with Ms Merkel's Protestant, eastern roots. While socially conservative and known for opposing gay marriage, Ms Kramp-Karrenbauer is also a strong supporter of the minimum wage and workers' rights. In an attempt to distance herself from Ms Merkel and her leadership style, Ms Kramp-Karrenbauer has said the CDU will need to regain some passion if it wants to attract younger voters. Sometimes known as AKK, she is the daughter of a teacher and is married to a mining engineer, with whom she has three children. Jens Spahn, 38, has become one of Ms Merkel's most outspoken critics within the CDU since her decision in 2015 to welcome more than a million refugees, mostly Muslims from war zones in the Middle East. He positions himself as a politician from Germany's rural northwest who is sceptical of urban liberals and the globalist elite. In an attempt to rein Mr Spahn in, Ms Merkel this year named him health minister - a thorny portfolio that brings a lot of work and few headlines. A member of the lower house of parliament since 2002, Mr Spahn has been praised as a rising star for years by senior conservatives such as Wolfgang Schaeuble. However, his anti-immigration rhetoric at the height of the refugee crisis cost him sympathy among Ms Merkel's allies. His public friendship with Richard Grenell, US President Donald Trump's ambassador to Berlin, has also raised eyebrows among conservatives who dislike Mr Trump's policy style. Mr Spahn is a Catholic like Ms Kramp-Karrenbauer but, despite the church's opposition to gay partnerships, is married to Daniel Funke, a senior journalist at the magazine Bunte. Friedrich Merz, 62, was the first to throw his hat into the ring after news leaked that Ms Merkel would not run again as CDU leader, according to party sources. Mr Merz, a member of the CDU's conservative wing, has coined the idea of a German 'Leitkultur', or 'lead culture', with which he called on Muslim immigrants to assimilate and to adopt German values and traditions. He is also known for his proposal to simplify the annual tax return so that it could be written on a beer mat. Mr Merz is among the many conservative men who have seen their political fortunes dwindle under Ms Merkel. In 2002, she pushed him out of his position as CDU parliamentary leader to cement her grip on the party, on her way to becoming chancellor in 2005. A trained lawyer and former member of the European Parliament, Mr Merz served in the German parliament from 1994 to 2009, and now holds numerous non-executive company board positions, including chairman of the German arm of the US hedge fund BlackRock. He is married to Charlotte Merz, a judge, with whom he has three children.